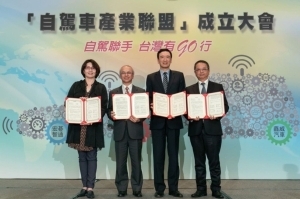 The International Bicycle Design Competition (IBDC) is recognized as the launching pad that uses motivation-breeding competition to promote young talent in the international bicycle industry, with its prominence enhanced by its being staged in Taiwan, home to Giant and Merida and many subcontractors who supply parts to renowned brands. 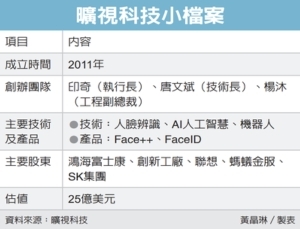 This competition, hosted by the Cycling & Health Tech Industry R&D Center (CHC) and sponsored by the Department of Industrial Technology, Ministry of Economic Affairs, and Taiwan External Trade Development Council, is taking place for the 19th time this year. 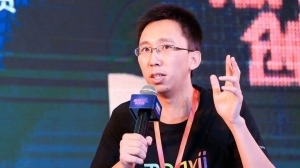 The jury for IBDC 2015 chose 20 winners from among the 331 entries. 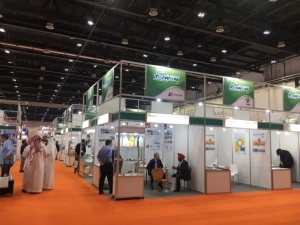 In their judging session in late 2014, a panel of international experts selected 20 innovations as the prize-winners, one of whom for some reason relinquished the award to leave only 19 entries for the final selection. 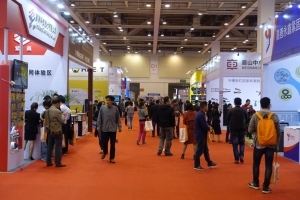 The award-winning designs were also displayed at the Taipei CYCLE 2015 on view to an international audience of trade professionals. The IBDC is also known as an important stage for established and up-and-coming cycle designers to present concepts and hopefully come away better informed with horizon broadened. 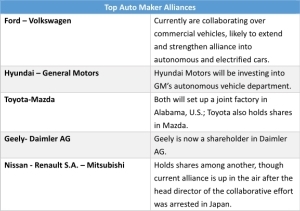 The competition also enables the CHC a chance to tap worldwide design resources for perspectives on global lifestyles, consumer behavior and trends. 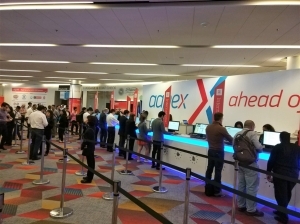 Such event also breeds an atmosphere of interaction to update the cycle design community on the latest trends, as well as help to tweak impractical concepts and ideas into more marketable products to meet perhaps localized demand. 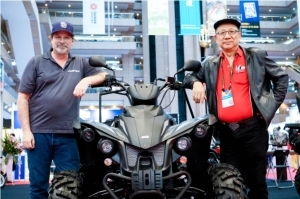 The Buddy was inspired by an innovative concept to combine an electrical bike and a self-chargeable trailer. 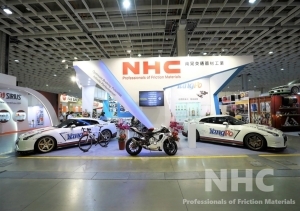 The trailer, housing two rechargeable modules, is functionally innovative in that it provides the electricity to propel the bicycle as well as make the bicycle a carriage for refrigerated objects. 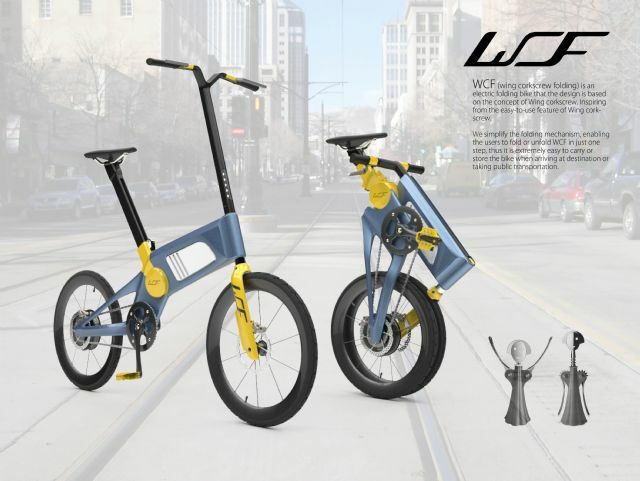 The "WCF" is an electric, foldable bike designed based on the concept of a "wing corkscrew," featuring ease of use by simplifying the folding mechanism into one capable of being quickly folded and deployed. The design targets users typically riding short urban commutes that call for no-fuss carrying, storage of bicycle even onto public transport as mass rapid transits. 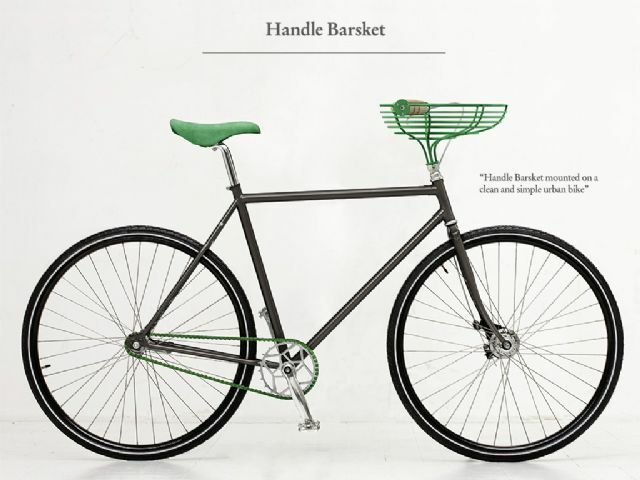 The "Handle Barsket" is a new design in urban bike accessory that combines the bike and the basket. With the brakes and the gear shift mounted on the handle as usual, the design concept of the bike basket is like a handbag for small items where a cyclist can put his/her personal belongings that can be kept within sight. 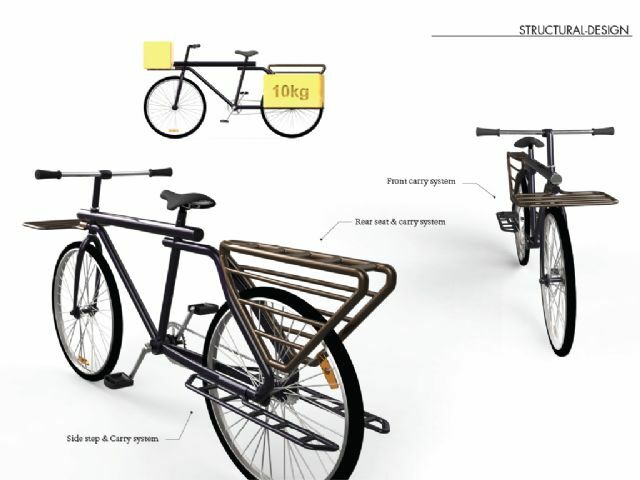 The "Bicycle: D" is designed specifically as cargo bicycle to be used in developing countries (such as Congo, Tanzania, and Rwanda). 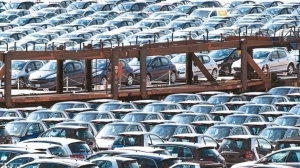 The designers have taken into account not only price of product but also the possibility of structural adaptation of the frame to adapt to cargo carrying that suits individual terrain. The "Eon" bicycle is designed to be very functional and fit seamlessly into the emerging modern context. With a frame manufactured with increased functionality by using pressed aluminum that is seam welded, the Eon also has enhanced rider functionality with an added rear camera that links to one's cellular device. The handle bar provides a live link to oncoming traffic. Twin rear lights are also integrated into the frame to increase safety, which imitates that of a car. 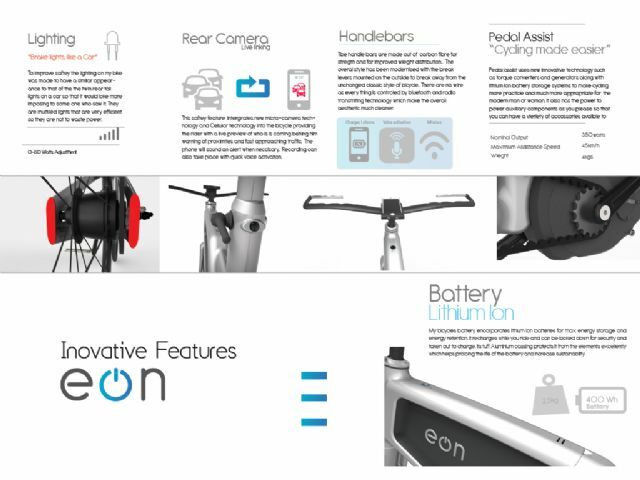 "Eon" also integrates the pedal-assist motor system to follow the trend of electric bike into the future. 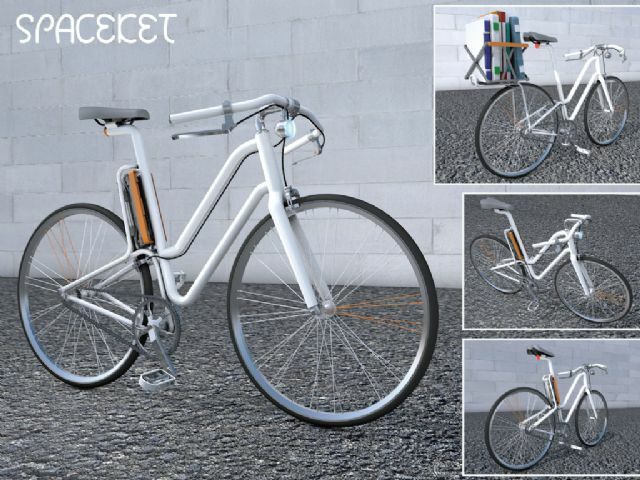 The "SPACEKET" is a bicycle designed specifically for commuters and those needing short-distance travel. Short commute riders would find no other bicycle than SPACEKET, which is designed to maximize functionality within minimum volume or footprint, achieved by “folded storage” that meets demand for both lean storage and ease of use for cyclists. 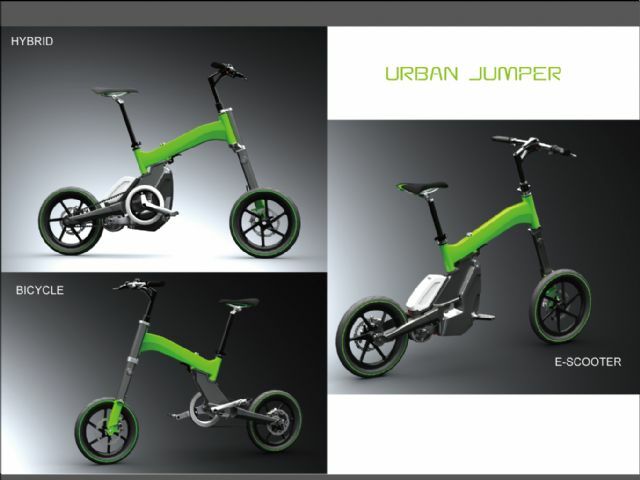 The "URBAN JUMPER" is a folding e-bike designed mainly to cross the so-called "last mile" or the gap between final bus stop and home. 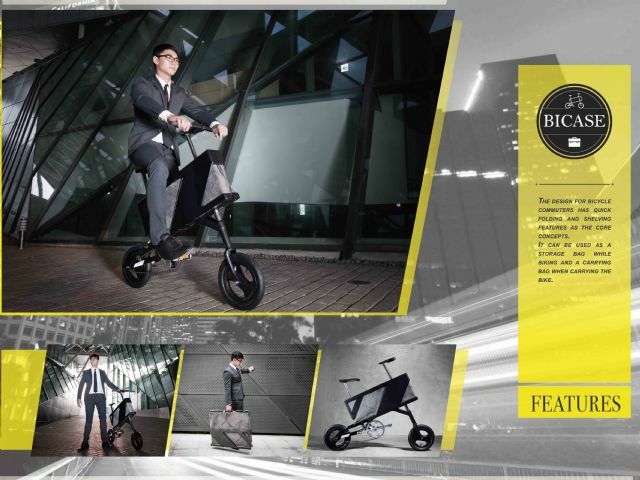 Its modular design enables three modes of usage: Bicycle, E-scooter and hybrid. With detachable power-booster and crank set, riders can easily switch to the needed mode at will. 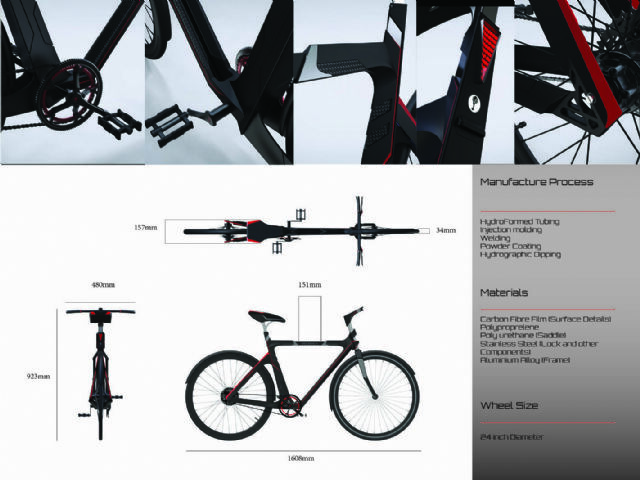 A bicycle that may be breaking new ground in structural design, the Wing Cycle, unlike conventional tubular frame, is inspired by the concept of bio-mimicry with the frame sort of taking after the micro-component of a flying bird. 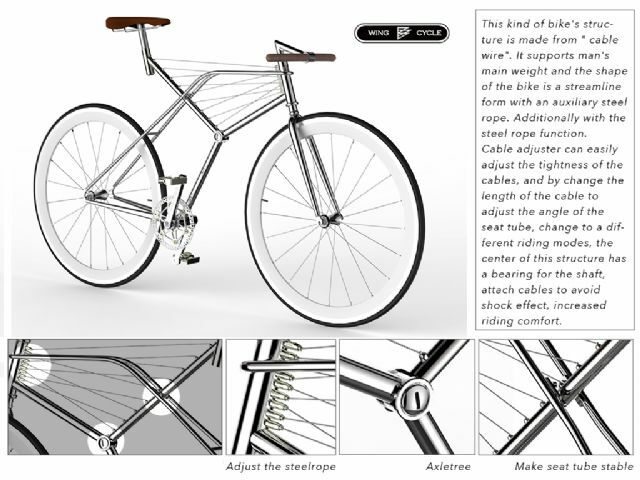 The frame is mainly comprised of “steel wires” and the tubular frame owes its unique streamline design to the auxiliary steel wires. The "Banten" features a moustache handlebar, one headlight with powerful beam aimed forward, with two small, yet bright rear lights aimed downward to warn oncoming traffic during commutes at night. A storage space with buckles comes with the super formed frame, with a U-lock also incorporated in the frame to spare riders having to carry one. The "Citcom" features design from a cost-cutting perspective, with its manufacture facilitated to reduce production and material costs. 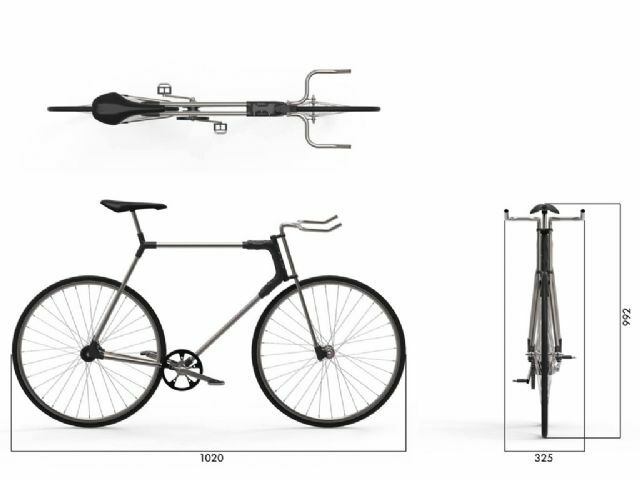 It reenvisages the traditional bicycle frame by combining an alloy twin-tube frame with a plastic lug system. The design is modest so as to remain indifferent to more striking styles and preferences, to serve a larger buyer market without as a blank canvas. Citcom's handlebars can be chosen with a variety of bends to suit different riding styles, and the belt drive is removed by first removing the rearmost lug. 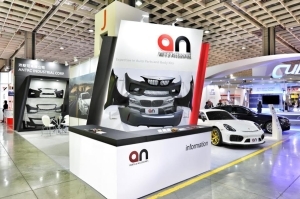 Citcom aims to show the obvious influence on modern design by industrial design. 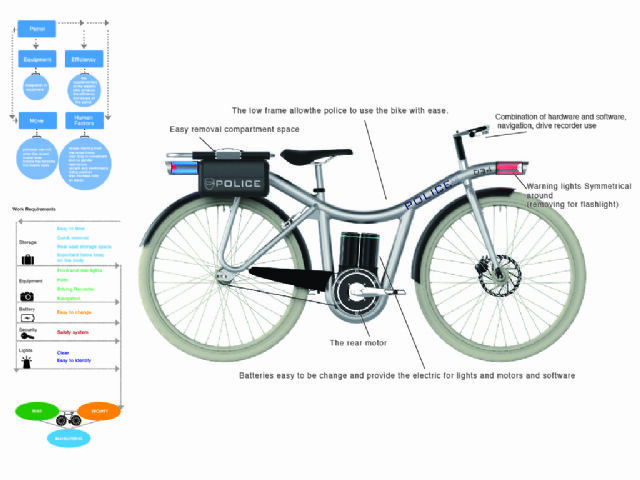 The "CRUISER" is an electric patrol bicycle designed specifically for tourist areas. It is integrated with a combination of navigation and camcorder. In addition to easy battery change, the front and rear lamps are designed with symmetry to be easily recognizable, also being detachable to double as flashlights to provide mobility and convenience, increasing both safety and image of patrolmen in tourist areas. 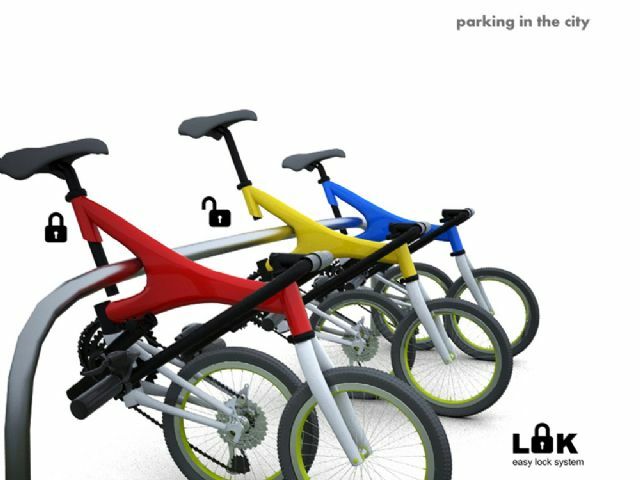 The "LOK" is small folding bicycle with 16 inch wheels. The folding system and saddle repositioning or reconfiguration enables locking the whole bicycle anywhere. 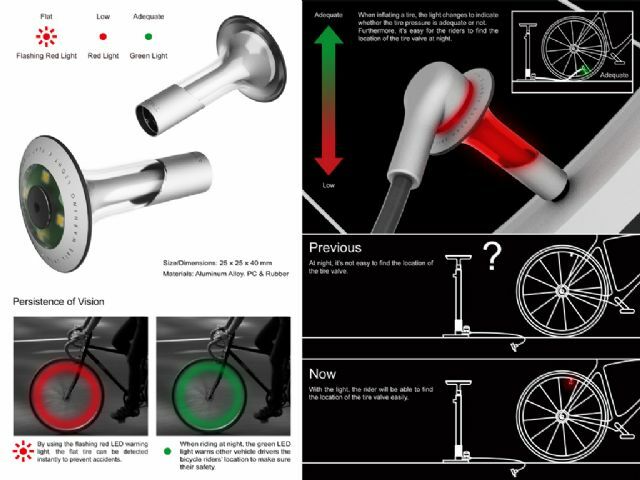 While conventional bicycles take up a lot of space while parked to be inefficient space user, this bicycle overcomes such issue by designing the saddle to be also a lock while parked. 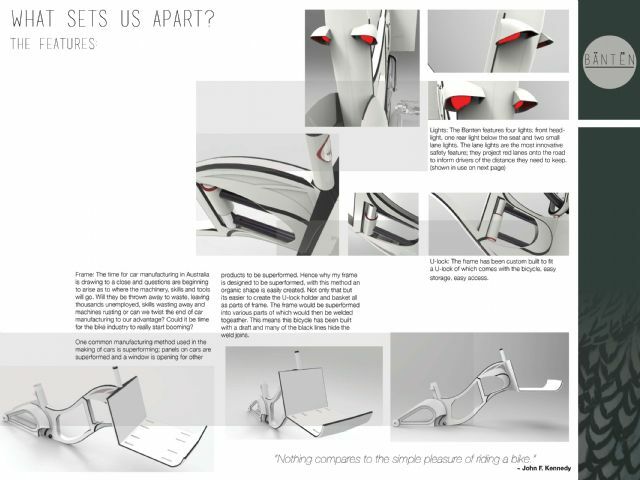 Plus the bike is foldable into a compact form to facilitate transport and storage. This bicycle, equipped with electric motor, could be a new option for bike sharing systems in city. The "REDBACK" is a lightweight aluminum commuter bicycle. Its saddle is designed with a concealed compartment to securely store personal items like keys, wallet, and cell phone. Integrated in the frame tube is a rechargeable set of batteries which power the built-in lamps and enables charging other electronic devices through USB ports. A unique, built-in lock enables easy locking the bicycle to any public bike rack to meet demand for hassle-free anti-theft function. The "X-COLE" facilitates the trip from city to those cross-country tracks in a small car. 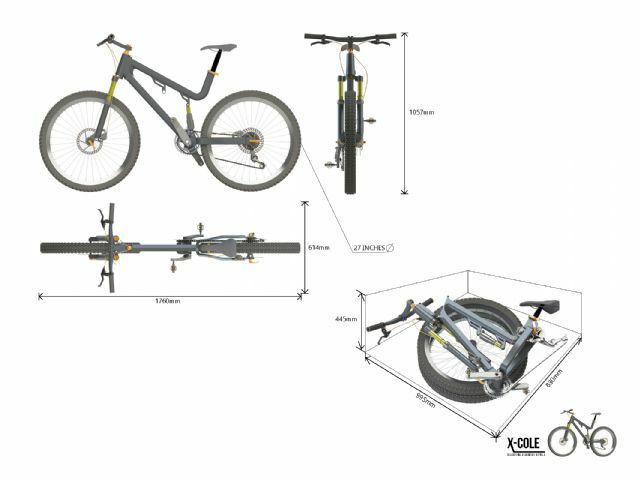 The smart collapsible frame enables a rider to halve the size of the bike without removing too many components. With a quick release front tire for added convenience, this bike is less awkward to lift and will securely fit in a small car. The X-COLE has a quick knockdown and set-up system with only a few steps (achieved with some smart, quick clamps and spring loaded components), so there's no wasting time getting out a car and onto the tracks. 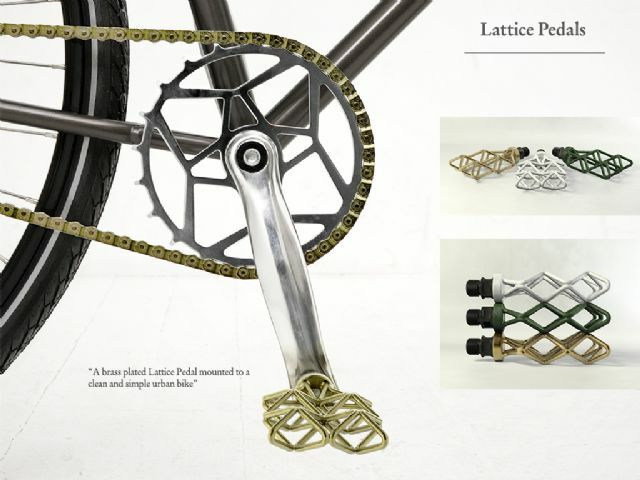 The "Lattice Pedals" are constructed from only four pieces of bent chromoly steel wire, a bearing housing and a standard thread connector. The bent wires form a three dimensional lattice that uses geometric structure to achieve incredible rigidity and strength with exceptional lightweight (under 200 grams). 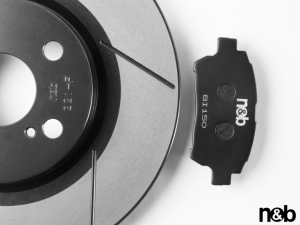 The unique axis-free design replaces the two tiny internal bearings normally used on pedals, with one oversized, much more wear- resistant outter bearing. The Lattice Pedals are specifically designed for urban cycling markets where stylish accessories and overall aesthetics are often priority. The "Bicase" is designed for cycling commuters and even office workers. When the bike is unfolded, the mid-section will be the storage space for briefcases, paraphernalia and other accompanying items. After the bike is folded, it is easily carried simply by pulling down the storage bag that was on top to convert it into an appliance holding the bag. Such design not only enables a rider to easily get on and off public transport but also carry the bike directly into office as a briefcase. 3. Making visible the bicycle at night with green circles of LEDs that achieve rider safety during low ambient lighting. The bicycle also uses forward motion to convert, with vibration generating chips, such vibratory energy into electricity. "Pleasure Infancy" is a sidecar for bicycles designed specifically for strollers, enabling moms to bring along babies easily without care while riding for recreation, to shop, picnic or visit friends and relatives. Pleasure Infancy does not interfere with a rider's dismount when he or she stops to walk so as not to disturb a baby. 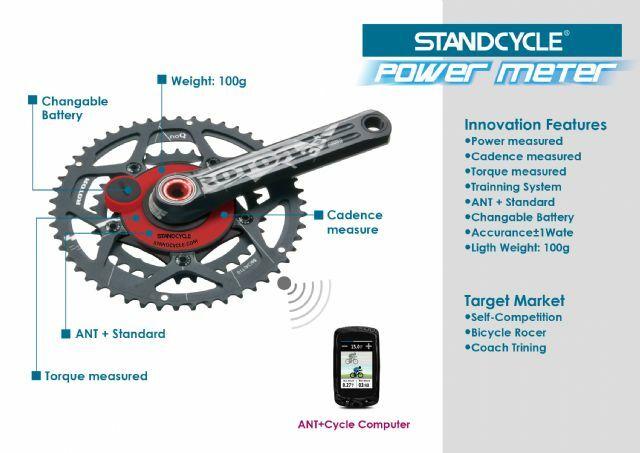 Standcycle Power Meter is designed to measure and display the riding status in real-time. Using the instant data on the power meter, both coach and cyclist can better understand monitor various parameters of cycling and cyclist, enabling both to set preferable riding and training programs. It provides cyclist with accurate information on vital signs and also avoids sensing errors with a heartbeat strap.